Fallen trees across a footpath, fence and a bridge were cleared back last week using a long reach pruning saw attachment in conjunction with a small conventional chain saw. The upper branches of this fallen tree were blocking one of the Troutbeck footpaths. The pruning saw at work removing a potentially dangerous split branch. The small chain saw was used for the lower branches. The brash was cleared away (to become a habitat for invertebrates) and the footpath is usable once again. The next job was to deal with this uprooted tree that had jammed itself, during recent floods, against the ancient clapper bridge that spans Troutbeck on the track to Threshthwaite Cove and Hartsop in the Patterdale Valley. ..... enabling the chain saw to get within reach and reduce it still further into more manageable lumps to be cleared away. The clapper bridge minus tree! The bridge sustained some damage during the floods. Although it looks to have impressively maintained its structural integrity, one of the slate slabs was flipped over from the immense force of the flood waters. One more tree to deal with was in the Troutbeck Valley...much lower down from the clapper bridge....Here a tree had fallen across a recently fenced off section of Troutbeck. See post...Troutbeck Fencing Project. Here too the pruning saw was indispensable. The chain saw was used for the final lower cuts. The fence is now ready to be repaired....When this image was taken it had become very dark and the rain was, yet again, lashing down. The camera flash went off illuminating one of the drops of rain giving it a bright orb effect. (Centre right). Repair and clean-up time after the storms. Recently our prioriy work has been to either rectify damage or clean-up the mess left by the spate of recent storms. Here are just two examples from last week! This post and rail fence and water heck, separating woodland from pasture land, was demolished when the beck burst its banks during exceptionally heavy rainfall... courtesy of Storm Desmond! The beck flows through woodland adjacent to one of the routes to the Garburn Pass. (Near Troutbeck Church). 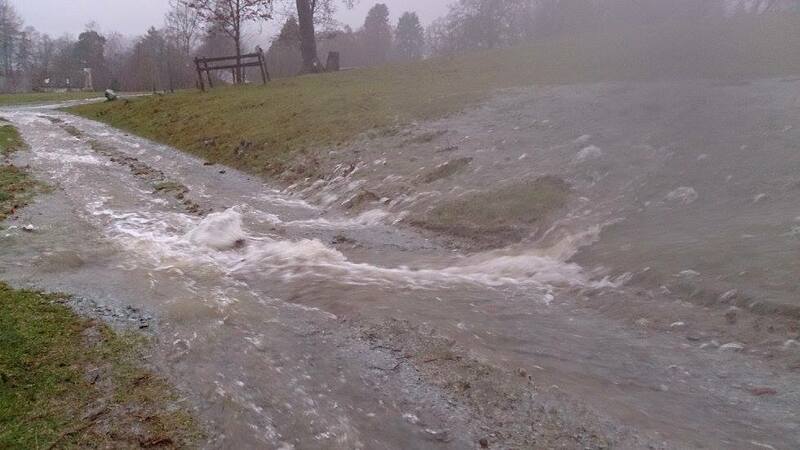 It then flows through Howe Farm pasture land and under the A592 prior to joining Troutbeck. 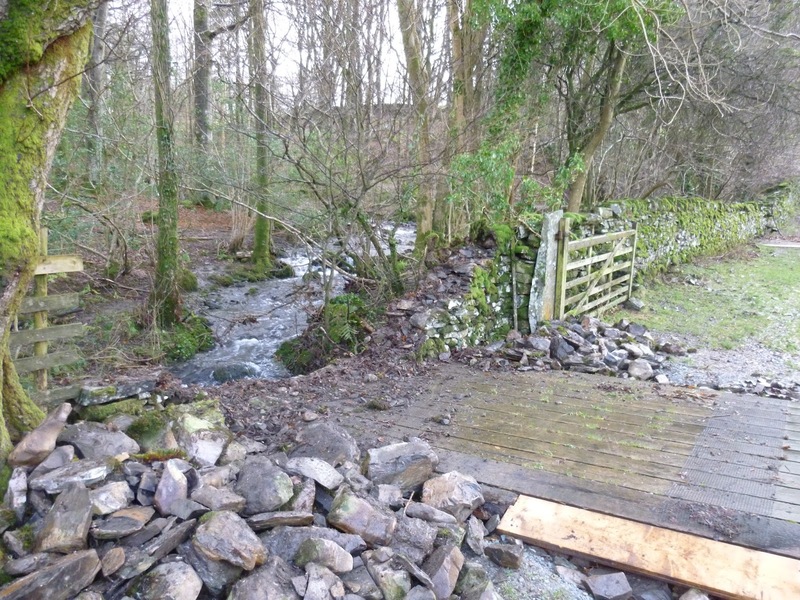 This is an image of the beck after the wreckage of the old fence and water heck had been dragged out and cut up. 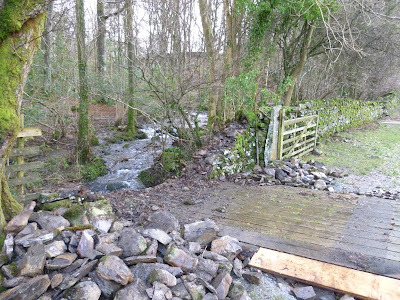 Boulders were also removed and gravel scooped out to allow the beck to flow more freely. With the preparation work completed, construction work can begin. The ground was very slippery and muddy so Sam is using the power barrow as a work bench to construct the new improved water heck! Ray is in the background using a 'driveall' to knock in a fence post. The completed work. It is much stronger than the original and the heck is also sturdier and much wider. This should hopefully cope with future flooding. The whole job took just over a day to complete, helped by the ease of access to the site and its close proximity to our base at St. Catherine's. A lot of debris was left at Cockshott Point on the eastern shore of Windermere after the floods. Just how much soon became apparent once the flood water had receded; it also gives a stark reminder of the hight of the water level at its peak. Unloading the brash onto the fire. Looking tidier but much work still to do! Retaining wall rebuild...Queen Adelaide's Hill. During one of the recent storms a tree at the base of Queen Adelaide Hill fell across the A592 (Rayrigg Road). As it fell a section of retaining wall collapsed below it and when the root plate lifted it ripped out part of the stock fencing behind. With the tree removed and the fence repaired it was the turn of the wall to be rebuilt. Sam, from South east Cumbria and Morecambe Bay, is helping us out this week...seen here beneath the stump of the offending tree...He is cutting back brambles prior to starting work on the wall. With the stone cleared back, the foundation stones can be put in place. This is an image from above of the wall during the rebuild. On a dry-stone retaining wall the stones are best placed 'end in end out' to give it as much strength as possible. The wall close to being finished. The competed wall with Sam giving the pavement a final sweep. Wynlass Beck flows through St. Catherine's Estate on its way to Windermere, England's largest lake. The beck is fast flowing and even after moderately heavy rainfall it is contained by its banks, as seen in the above image. Above St. Catherine's, Wynlass Beck flows through Low Hag Wood which is surrounded by a dry-stone boundary wall. Before it leaves the wood, the beck splits into two and flows under two bridges. Even after the usual heavy rainfall expected in the Lake District the culverts, set into the wall, are well able to cope with increasing water levels.....until recently! The extraordinarily heavy rainfall in December increased the volume of water in Wynlass Beck to such an extent that it overwhelmed the culverts and then 'backed up' spilling over onto the access track to St. Catherine's, The Footprint and Gatelands. This is an image of a small section of the track after the flood had subsided. To combat such high volumes of water in the future , sections of wall were taken down by the two bridges and then rebuilt incorporating water gates or hecks. These will allow the beck to flow freely over the bridges should the need arise. The surplus stone will be recycled for use elsewhere. One of the two hecks under construction. ...and for the upper bridge. Since these hecks were built they were put to the test within a week when yet again torrential rain swept through the area but this time the swollen beck was able to flow through with ease!